Advance registrations will end at noon the day prior to the event. After that time, walk-ins are accepted. Sponsorships: Sponsorship opportunities are available for this event. Please click here for information - additional sponsorship information which may be of use may be found here. You may register for these by clicking the register button on this page. *Registration includes delicious appetizers + one drink ticket (beer or wine); cash bar available. **Advance registration not required; however, those who register in advance will receive a better rate and be eligible for door prizes. ***No refunds will be given for no-shows or cancelations. 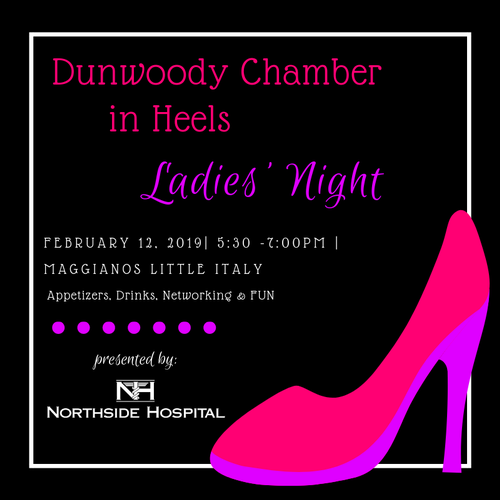 Please make plans to join the ladies of Dunwoody Chamber in Heels on February 12, 2019, from 5:30pm to 7pm for an exciting After Hours at Maggiano's Little Italy! This exciting networking event affords businesswomen the opportunity to network with other business leaders throughout the Perimeter Market while enjoying wonderful appetizers and cocktails at one of our member restaurants. *Remember to bring an abundance of business cards. **Sorry gentlemen, this event is designed for ladies only.